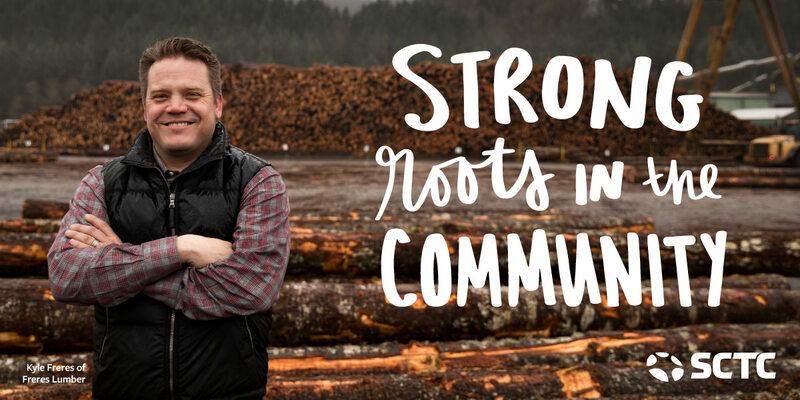 Kyle Freres—Vice President of Operations for Freres Lumber—knows a thing or two about business. His family’s business has been around since 1922, almost 100 years, and Kyle’s been part of it for the past 17. He loves our area, where his job lets him roam among the best forests in the world. “Our primary resources, trees and logs, are around us everywhere,” Kyle says. “It’s the best raw material in the entire nation.” Kyle also loves hiking and fishing, so he’s happy to call the Northwest home. Kyle enjoys working with great people and giving back to the community—the Freres Lumber foundation gives away more than $100,000 to the community each year. They count on SCTC to provide the fiber backbone of their business to enhance their accounting and information systems, provide real-time information on how their plants are running, and generally facilitate better communication among their three locations. And we’re thrilled to give them the tools they need for the next 100 years. Kyle appreciates the personal attention he gets from SCTC and the fact that SCTC knows him and his business. He values our relationship, and so do we. At SCTC, we’re proud to be part of a community that works together. How will you use our services to make something great, like Kyle Freres and Freres Lumber? Let’s start that story today.